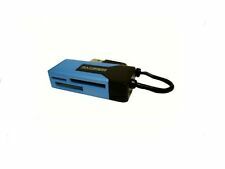 USB 2.0 MiniSD Mini SD Secure Digital Card Reader Writer. USB 2.0 Mini SD Card Reader only. Works with mini SD cards. No Adapter Required. Online sellers since 1991 LinXcel CR-BCA1-A-US USB 2.0 12-In-1 Mini Card Reader Online sellers since 1991 CR-BCA1-A-US The Mini card reader with pocket sized design makes an ideal travel accessory. Supports up to 12 various memory cards which are used in PDA's, MP3 players and digital cameras. ---Supports MS,MS PRO, MS DUO, MS PRO DUO, HS MS, SD, Mini SD, Micro SD (T-Flash), MMC, RS-MMC. ---Compliant with Universal Serial Bus Specification Ver 2.0 (Data Rate 1.5/12/480Mbps) ---Complies with USB storage Class specification Rev. 1.0. ---Operating System supported : Windows 98SE/ME/2000/XP, Mac. 9.x/X ,Linux Model No. Empower Your Productivity. As soon as we find out the status, we will let you know. Depending on availability and your location. The Caribbean. New Zealand. This code covers Region Coding. These accessories may not work in your Country. Password Authentication. Max.Access Users 5. 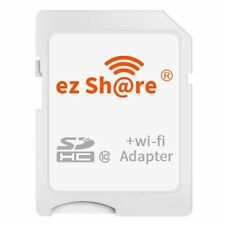 It can be used as a normal SD card while a micro SD/SDHC card is plug in Adapter. Wireless Standards:IEEE 802.11b/g/n. 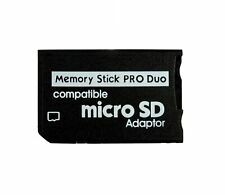 Compatible with MicroSD /Transflash card from 128MB through 64GB. Card Adapter. Brand: BaseQi Completely hidden and fits snugly into your Microsoft Surface Book's SD card slot Simple & Easy to adding storage space Add up to 400GB of extra spac Just Support Microsoft Surface Book2 15inch Note: This product does not contain a microSD, SDHC or SDXC card. Compatible Cards: SD / MiniSD / RS-MMC / MMC. Reads and writes SD, Mini SD, SD Ultra, SDC, T-Flash, HS-MMC, MMC, RS-MMC MMCII cards. Sold only reader without SD card. 1 piece of Kingston MicroSD to MiniSD Adapter. We will do our best to help you resolve the problem. USB 2.0 Version specification, Support USB 1.1 Version Specification. High transmission Speed, May Reach To 480 Mb/s. Support Hot Plug Easy To Use, No external power required. DO NOT send without communication. Maximizes speed and bandwidth of USB 3.0 computers, and supports the latest UDMA CompactFlash (including UDMA 7), SDXCTM, and SD UHS-I/UHS-II (SD 3.0) card formats. Leverages SuperSpeed USB 3.0 technology for high-speed file transfers, with a USB interface speed up to 500MB/s. Supports: M2 SD SDHC DV Micro SD Mini SD TF. Draw power directly from USB Port. Plug & play and hot swapping. Net weight: 12g. The images are for reference only. Color: Random. Size: 5 2 1cm/2 0.8 0.4in. Support for SDHC, SDXC, SD3.0, wifi SD, UDMA 6, I/O mode, IDE mode. An adapter card for SD to CF conversion. 1 Card Adapter. Support a single 128GB or more. Maximum capacity can up to 2TB. Item Weight: 7g / 0.25oz. SDHC compatiable for miniSDHC cards. Turn your miniSD or M2 Card into a USB 2.0 Flash Drive. Read / Write to your miniSD or M2 card (no adapter necessary!). Brand: BaseQi Compatible with: Dell XPS 13inch/Dell 9350/9343/6390 Completely hidden and fits snugly into your MacBook's SD card slot Simple & Easy to adding storage space Available for add up to 400GB of extra space Use aluminum material and each one is CNC precision machining Toolless : When you remove without any tools, just use your nail could be take it out Dustproof Note: This product does not contain a microSD, SDHC or SDXC card. Card Compatibility: MICRO SD/SDXC/TF card. USB 3.0 interface. 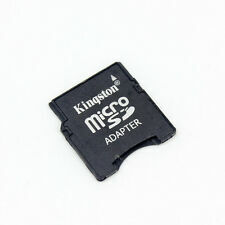 1 piece of Kingston MicroSD to MiniSD Adapter. 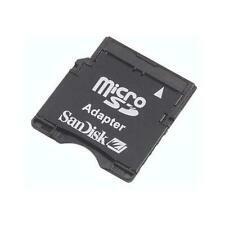 Supports: M2 SD SDHC DV Micro SD Mini SD TF. Draw power directly from USB Port. Net weight: 12g. Color: Random. Compatible Cards: SD / MiniSD / RS-MMC / MMC. Reads and writes SD, Mini SD, SD Ultra, SDC, T-Flash, HS-MMC, MMC, RS-MMC MMCII cards. Sold only reader without SD card. Note:Light shooting and different displays may cause the color of the item in the picture a little different from the real thing. Weight: 2g. Durability: 10,000 insertion/removal cycles. Interface type: USB 3.0. Width: 23 mm, Depth: 72 mm, Height: 15 mm. We are the Hi-Tech Lovers. Hope you will appreciate our seriousness and reliability. You can always count on us! For any information, we're here. 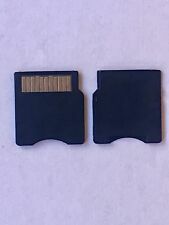 (10 pieces of Kingston MicroSD to MiniSD Adapters. excluded ). We will do our best to help you resolve the problem. CF I & CF II. MMC micro card. You can move, save, copy, or delete many types of data from your HC card for example photos, videos, MP3's, etc. You just place your card in its corresponding slot on the reader and then plug the reader into your computer via the USB port. 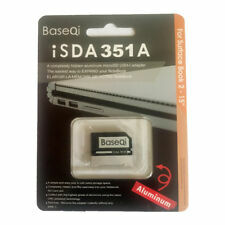 Designed for MacBook Pro/Air, used to expand the hard disk capacity of laptop. Micro SD/TF to SD converter adapter support high speed transmission. 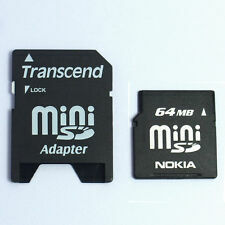 Support Cards Type: Micro SD, Micro SDHC, Micro SDXC. Multipurpose and New Design: 4 in 1 mini design with Type C, Micro USB, Micro SD,TF flash memory USB 3.0 stick, Lightning connector. Mini and fashionable design for more portable to use, wherever you are and whenever you want. High-quality Zinc Alloy for durability with key ring to prevent loss. Super Compatibility for Plug and Play: Support iPhone, Samsung, Android phone, iPod, iPad, iPad mini, iPad Air, iPad pro, Mac, Windows PC. High Speed to store and transfer the files: Reading speed: 18~40M/S; Writing speed: 11~20M/S. 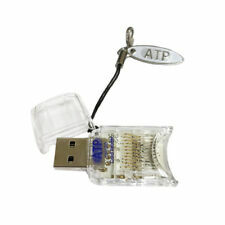 Support 8G~ 128G Micro SD card,TF card (not included). The test data will vary depend on different devices. Perfect card reader for transferring high-resolution images and video recordings.